Happy New Year everyone! I hope that you’ve all had a restful and enjoyable holiday period! Now that we’re into January and a fresh new year, we’re being bombarded with fad diets and extreme detoxes left right and centre and many people are out looking for that quick fix to get rid of some of the Christmas over-indulgences! Personally, I would not recommend diving straight into the nearest fad diet in an attempt to loose weight as quickly as possible, as this is less likely to be sustainable and is probably more un-healthy in the long run. How about, taking things slowly and focus on fuelling your body with nutrient dense, whole food ingredients, as well as trying to find food that you actually enjoy! After all, if you don’t enjoy what you’re eating or if it doesn’t make you feel good.. is that something that you’re going to want to continue long term? So it wouldn’t really be Christmas time without a spot of festive baking and what better place to start that with some gingerbread cookies! The smell of gingerbreads baking in the oven just fills the whole kitchen with the most amazing scent of warming spices and leaves me feeling so festive! These cookies are actually gluten free, as they’re made with a combination of buckwheat flour and almonds for the flour part of the recipe. They’re also completely free of refined sugars and instead are sweetened using raw honey and cashew nut butter. Both of these also help to bind the dry ingredients together. 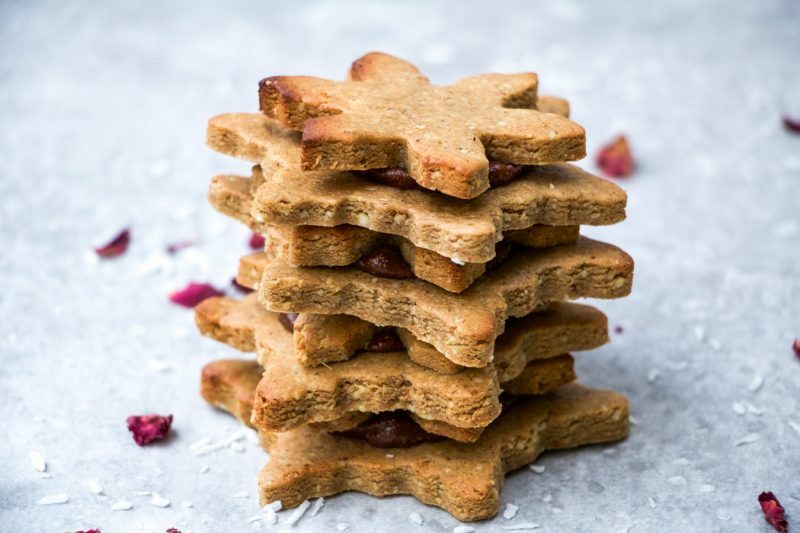 For an extra superfood boost, I’ve also added in some maca powder, which has a really delicious caramel like flavour- so works well in sweet treats! 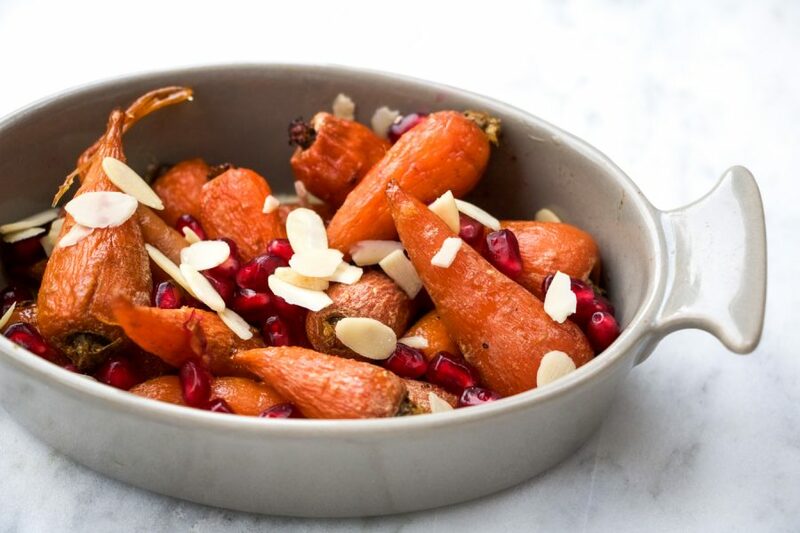 We’re getting into the festive spirit on the blog today with this delicious sticky honey glazed carrot recipe. I don’t know about you, but I actually love the veggie part of the Christmas roast.. it’s genuinely my favourite part of the meal and this recipe adds a little bit of an extra special touch to your typical roasted veggies. We wrote a post a little while back on the blog about the benefits of honey and it’s one of my favourite natural sweeteners to use, as it has such a unique and almost fruity flavour. It’s also got a really sticky texture, so works well when making things like cereal bars and home made granola! 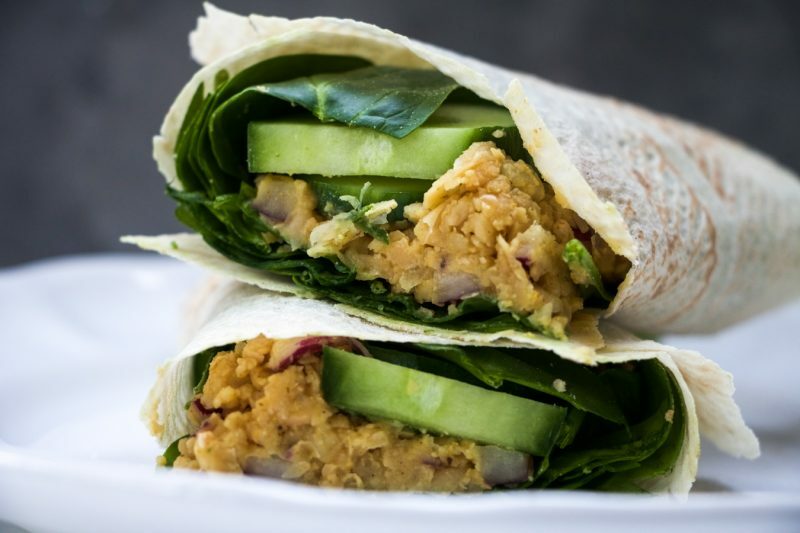 So, for last of our vegan recipes this month I thought I would share with you these curried chickpea salad wraps. For me, preparation really is key for staying healthy at work or on the go, and these wraps can be prepared the night before, ready for you to take with you before dashing out the door in the morning. Beans and pulses are a great meat substitute when leading a plant based diet and they’re also such vestal ingredients too. Chickpeas are actually one of my personal favourites and believe it or not, can actually be used in both savoury and sweet recipes. Yep, you read that right.. chickpeas work really well in sweet dishes too! Some of my favourites include chickpea cookie dough and blondies! But more on those later! This is the perfect recipe for a mid-week meal or something that you can prepare on the weekend for a healthy and speedy lunch to take with you to work or school during the week. Pasta is a great dish to cook for the whole family and make in bulk batches. 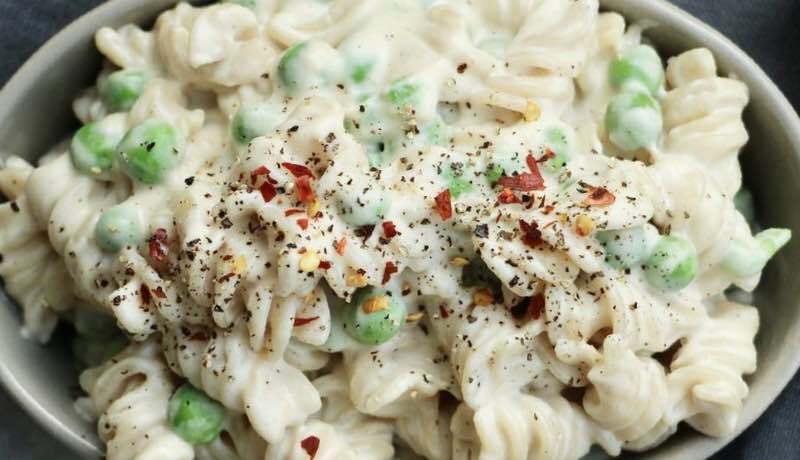 This particular dish is also completely vegan and also gluten free, made with brown rice pasta! 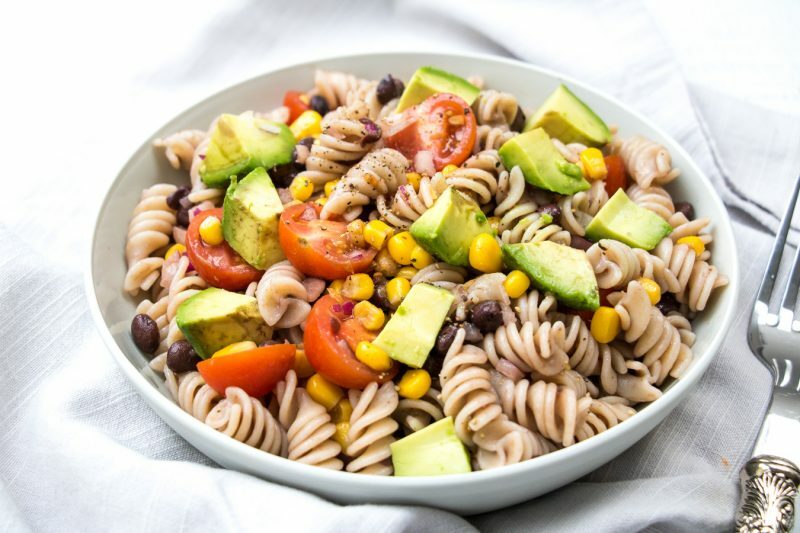 This pasta from Rizopia is a fantastic gluten free option, as it’s made from natural ingredients and is 100% brown rice; so is therefore naturally gluten free. It’s also available in a variation of different shapes such as: spaghetti, penne and lasagne sheets. If you’re a porridge fan, then you’ve probably already heard about overnight oats by now. They’re basically a cold porridge or bircher muesli type dish, that you can prepare the night before and allow to soak so that in the morning, you’re left with a simple and delicious breakfast for you to enjoy! They’re great if you find yourself a little stuck for time of a morning because alls you have to do is grab this from the fridge and you can easily take it out with you on the go. 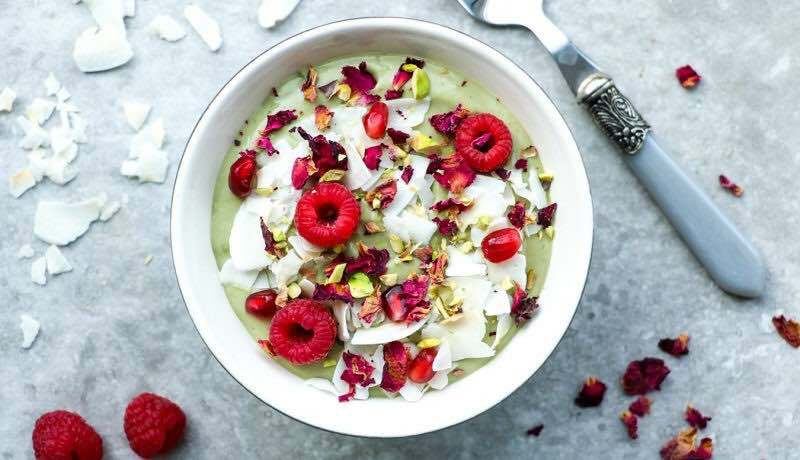 Just like porridge, you can also garnish these with an array of delicious toppings like fresh berries, nut butters and even some raw chocolate if you’re fancying a little treat! So this month is world vegan month and we’re going to be focussing on this as our theme for November. We will be bringing you a selection of healthy vegan recipes that you can whip up using natural, wholesome ingredients for you and your family to enjoy, as well as some of our top vegan cooking tips and other related blog posts. 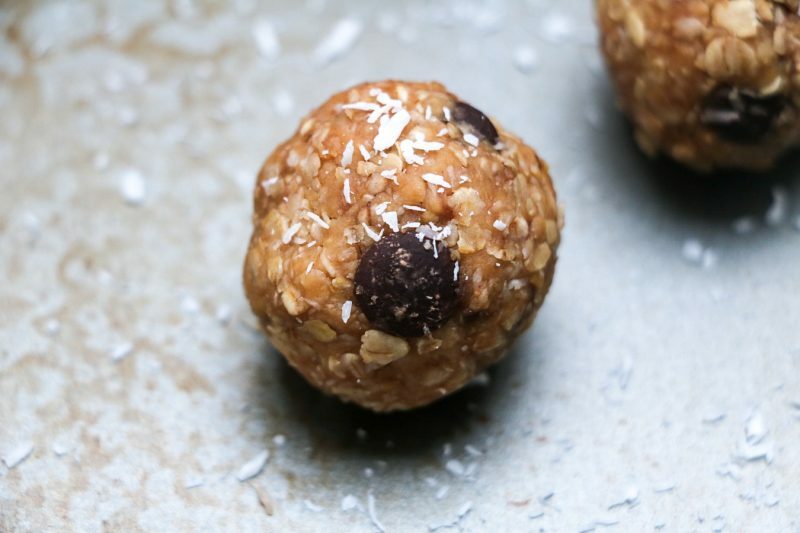 The first of these, is for these coconut chocolate chip peanut butter energy bites, which make for the perfect afternoon or mid-morning snack.. or even breakfast on the go. When I was first starting to make healthy changes to my diet and lifestyle, one of the main things that I really missed was cookies! I was never a massive fan of having lots of desserts and didn’t really have a major sweet tooth, but cookies were something that I’ve always loved to accompany a good cup of tea! Different people have different preferences when it comes to the texture of a cookie.. a little bit like with cakes and brownies. Some people like cookies that are slightly more crisp and crunchy, whilst other people prefer a gooey, cookie dough kind of texture. 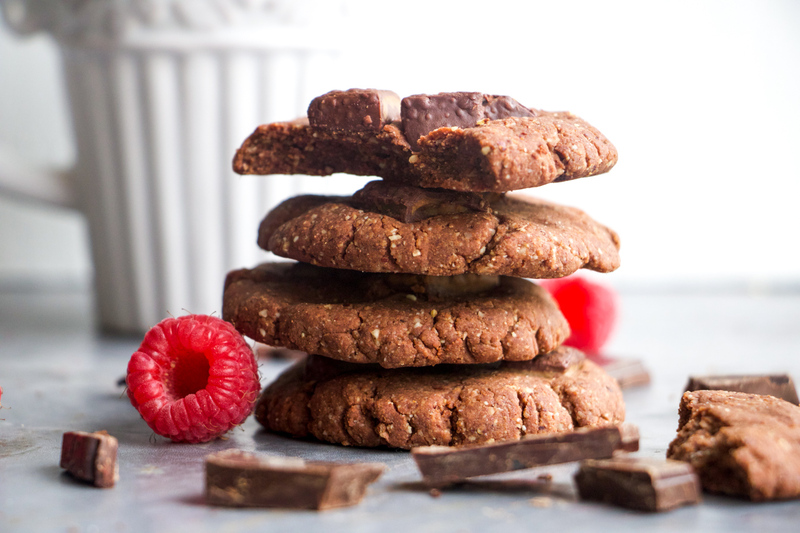 These particular cookies are on the softer side with delicious chunks of raw chocolate and an amazingly rich and indulgent flavour from the cacao throughout. I can’t believe how quickly this year is flying by and that it’s almost halloween already! Typically this is a day filled with lots of sweet treats and indulgence, which you can still enjoy with these slightly healthier little chocolate cups! 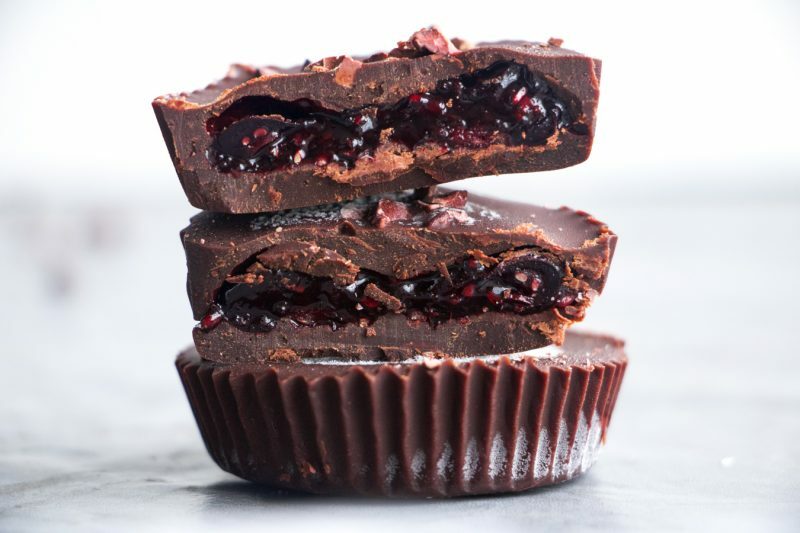 Based on a peanut butter cup kinda’ creation, these raw chocolate cups are filled with a delicious berry jam, to give them a slightly more halloween-ie twist! The berry jam itself is actually a pretty special one, as it’s made from mixed berries, chia seeds, a little natural sweetener and elderberry Imunostrength syrup for an extra boost! 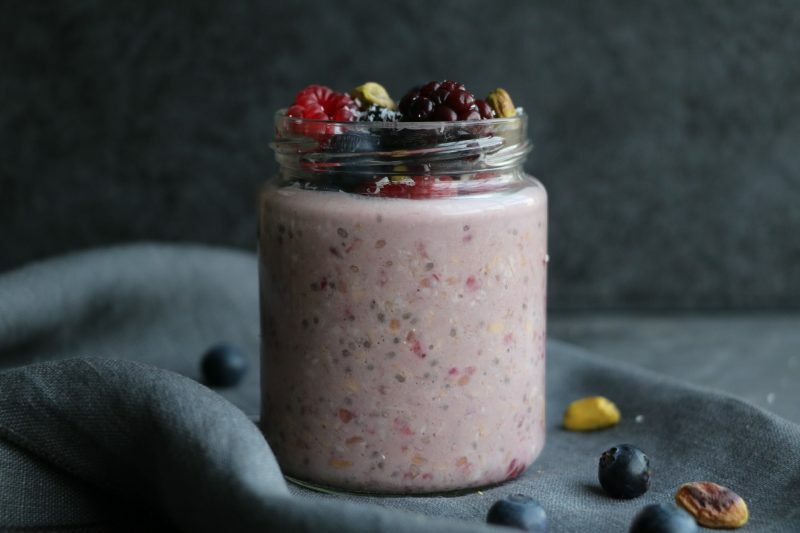 This is one of the best sellers in store during this time of year, so we thought it would be a great idea to experiment with adding it into to recipes- see overnight oats recipe here.